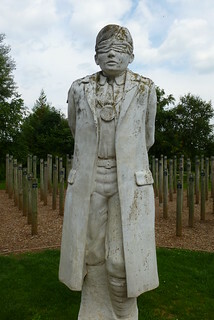 Part of the "Shot at Dawn" memorial. It consists of this statue and the stakes behind it. It commemorates a death due to desertion, cowardice, but mostly for being really, really, frightened and have all been pardoned. Each wooden stake/post represents a death.